On the afternoon of July 14, 2015, just hours after the first images from the New Horizons spacecraft were transmitted back to earth from its close flyby encounter with Pluto, a fond memory came back to me as I stared at the images of the dwarf planet. This memory I am writing about is the day I had the honor of meeting Pluto's discoverer, Clyde W. Tombaugh. The event took place on crisp fall day back in the early fall of 1987. Mr. Tombaugh was the keynote speaker for AstroAssembly, an astronomy convention put on annually by the astronomical organization known as Skyscrapers, Inc. based in Scituate, Rhode Island. I was attending the convention with my good friend and current Insight Observatory Science Writer, Dale Bryant, as well as other members of the Cape Cod Astronomical Society. Dale and I attended nearly all of the morning and afternoon talks given by both professional and amateur astronomers. After the final talk was given before the dinner break, we ventured out of the society's clubhouse and suddenly found ourselves within feet of Mr. Tombaugh and his wife, Patricia. I recognized him immediately from pictures of the planet discoverer in astronomy books and magazines I had read growing up. I recall my reaction was that I was simply stunned accompanied with excitement. Not wanting to miss an opportunity for a picture, I asked Mr. Tombaugh if we could have a photo taken with him. He graciously replied "That would be fine". 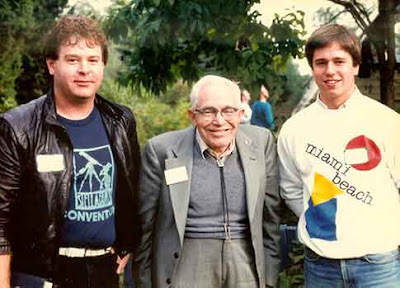 At that moment a fellow member of our astronomical society, Rich Zitola, took a picture of Dale and I with the famous astronomer. For many years an enlargement of this picture has been a permanent fixture on my fire mantle. As I studied the detailed images of Pluto on my computer while this wonderful memory came back to me, I couldn't help but feel a bit melancholy. I was thinking how much I wish Clyde was still around to experience these spectacular images with us of the planet he spent years looking for and finally discovered on February 18, 1930. It is only fitting that a small portion of his ashes was placed aboard the New Horizons spacecraft with the inscription on the container "Interned herein are remains of American Clyde W. Tombaugh, discoverer of Pluto and the solar system's 'third zone'. Nice recollection, Mike. I feel like we're standing right next to him now! Thanks for that recap! I was very honored to have meet him that day back in September 1987! His talk that night on how he discovered Pluto was very inspiring as well. Seems like it was yesterday.